The Selroti is a famous street food in Sikkim. 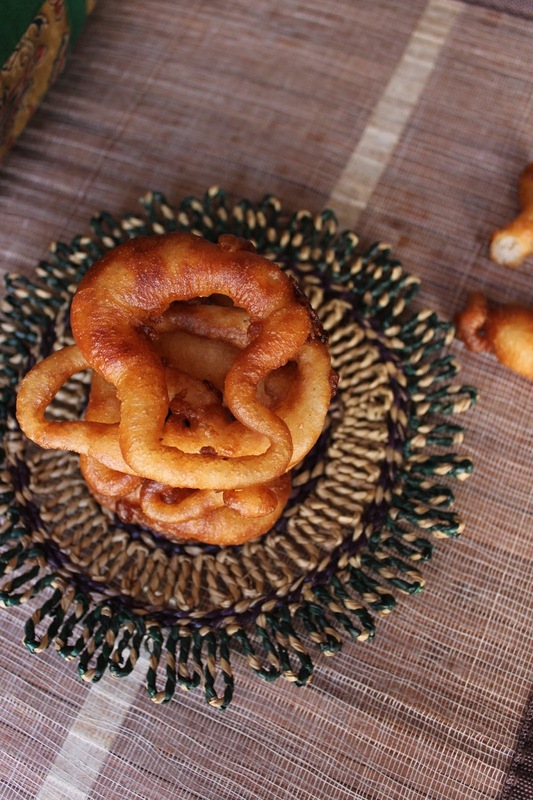 It is this ring shaped deep fried sweet bread made from ground rice, banana and sugar. Getting the ring shape is not easy and predictably my Selroti is anything but ring-shaped. I am not even a “round roti maker”. I realize that that sentence sounds a little funny. I mean I can’t make perfectly round rotis (round that I am now) if my life depended on it. I can make any shape but a round one. These Sel rotis were out of the question. I tried my best in between bouts of yelling at the kids to stop fighting, to switch off Chotta Bheem, to not pour water on the chairs. I couldn’t find a banana (would you believe that? ), so I skipped that. A couple of bananas usually lie around on the dining table browning slowly. But that day, there wasn’t a single banana. Like the time I decided on a cake recipe, got the oven preheated oven, measured out flour and sugar, brought eggs to room temperature and then realized I didn’t have butter. “Mise-en-place”, I always misplace (‘cos I am a nutcase). Sikkim is a very small state in the north-eastern part of India. It has a Nepali majority. It is mostly hilly. Now I remember. We’ve been to Gangtok (in Sikkim) on our honeymoon. We went to the Rumtek monastery also. I remember buying a Chinese style kimono type top in the Gangtok market that I never fitted into and which is doing duty as a prop for my Chinese food photos. I never had a chance to try these Sel rotis though. The sel rotis that I made were nice and crispy on the outside and a little chewy. I tried making a small batch as I wasn’t sure how they’d turn out. They were pretty good but they soak up quite a bit of oil. They’re nice to munch on with your tea or coffee. 2. Grind soaked rice adding a little water to a nearly smooth paste. Add sugar, ghee and banana, cardamom powder and grind again till everything is incorporated. Add a little water if necessary to make a pourable pancake type batter. Beat well. 3. Heat oil in a wok for deep frying. 4. Use a small ladle or a squeezy bottle to pour batter into the oil in a ring shape. Make as many rings as the wok will hold. Fry on medium-low till the rings turn golden brown. Remove with a slotted spoon to absorbent paper. Repeat with the rest of the batter. 5. When the sel roti are completely cool, store them in an air-tight container. Keeps for up to a week. This entry was posted in Appetizers, Desserts and tagged appetizer, Blogging Marathon, deep fried rings, dessert, recipe, sel roti, sikkim cuisine, snack, sweet. Looks like a sel roti day…and we can see various versions. .each one. One better than the other. Yours looks very much prefect Jayanthi, can see varieties of sel rotis for Sikkim,beautiful choice. Lots of sel roti today. Yours looks just fine. And it is the taste that matters. I am sure it was tasty. We too went to Gangtok (darjeeling and kalingpong later) for our honeymoon. I dont remember anything about food, but the stay was nice and beautiful! And it seems to be a sel roti day in BM for Sikkim :). Nicely done! so many sel rotis!!! looks so crispy and delicious..
Good one. Looks like this is very popular from Sikkim. I always see myself chuckling when I read your posts Jayanthi. You have the art to write and rhyme. Sel rotis look crispy and since I don't know how the real ones look, I'll say yours look pretty darn good. Another sel roti of the day,such a delicious one..
You are funny Jayanthi! So I am not the only one who had a hard time getting the shape right. I made another dish since the shape of roti were so off. Had I known most of you had the same problem, I would have stuck to the sel roti. But I am glad I tried a curry as that was pretty good too. Sel roti looks interesting and must have tasted good..
Jayanthi you have company! Even I cannot make rotis even if my life depended on it. My family dreads" the maid not coming day"!